This past weekend we had a “family” party for both the girls. Emma had her First Communion, and Rose’s birthday is coming up during the week. I decided we could toss those both together as a good reason to have friends and family come visit with food and wine. This would mean hosting a lot of people in very little space. Usually we have these “do’s” out in the backyard so there’s lots of room for everyone. Of course that didn’t work out for us this time. 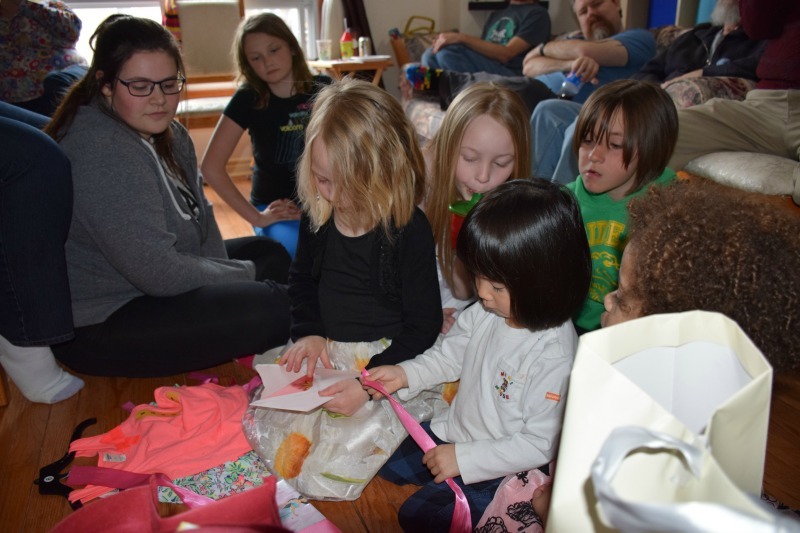 I had almost 30 people in my multi-level, semi-detached house full of clutter and kids toys. Luckily 5 or 6 of them were classified as “kids” and went to play in the basement. One of those was my awesome babysitter (who belongs to my awesome daycare lady – how convenient is that??) who can referee the kids when they go wild down there. I’m sad she’s going off to college in the fall. I mean I’m happy for her, but sad for us that she’ll be gone 8 months of the year. She’s a great sitter for the kids. Be flexible. If the sun had been out, we would have enjoyed the back deck, but it wasn’t so we cleaned up and found extra chairs so everyone could have a seat. Well, mostly everyone. There was a point where I was sitting on the floor but that’s fine too. And we had extra folks show up at the last minute, but hey, that’s how family works, right? Don’t sweat the small stuff. Everyone will make the best of your party. Have some stuff for the kids to do in another room. We did market this to Rose as a birthday party, so we let all the kids make a mess (and a ruckus!) downstairs while the adults visited on the main floor. Use portable seating – we have some folding chairs which we can use around the dining room table, or outside in the yard. We also were given* these cool Pouch Couches. They store really small, and you inflate them when you’d like to use them. They work best outside, but you could for sure seat 3 or 4 kids (or maybe 2 adults) on one inside if you have the floor space! Have folks show up at staggered times. This way you don’t have to cope with 20 people arriving in the same moment. I didn’t plan our party this way, but that was how it turned out and it really was great. The earlier arrivals left a bit earlier as well, so we were able to have pretty good quality time with everyone. Empty your dishwasher before the party starts, and use paper plates if you can. Clean up as you go – paper plates get composted here so everything just gets green binned at the end. It’s great! I was impressed with our party. Everyone got along, most people showed up when they said they would, and clean up went pretty well. I would have liked it more if we could have been outside, but Mother Nature wasn’t up for that. I’m still eating leftover food, and there are still toys in my basement that don’t really live there, but overall, party success! Do you have any tips for hosting a lot of people in a little space? Please, share them with me in the comments, so I’m ready for next time! * Pouch Couch sent me free product in exchange for a mention on my blog. If you have a product or service you would me to review or mention on this blog, please contact me, or visit my Work With Me page for other ways to work with A Modern Mom’s Life. Isn’t it amazing how quickly ‘immediate’ family turns in to dozens of people? That’s happened here too! Hubby’s side is 4 sisters and their families, at least 20 people. It’s nice, though, when everyone pitches in. Thanks for your comment! Lol. This is the story of my life. Always having people over. It’s fun, but I much prefer being outside for our parties. Thanks for stopping by and leaving me a comment! Excellent advice! I can’t believe you had 30 kids in your home! I don’t know if I could handle that haha, mine is still very young. : ) and very sad your babysitter is leaving! I’ll have to make sure people come at intervals, my flat is small. Thanks so much for sharing with #StayClassy! To clarify – it wasn’t 30 kids, but 30 people total. I really liked the staggered arrival times. It was about an hour or so over which the people arrived, but it did make a difference. I’m glad you enjoyed my article. Thanks for commenting! Yes, I was really happy about the staggered arrivals – even though it was unplanned. Sadly, as the host, I always feel I don’t get my drink topped up as much as I’d like to! Thanks for reading! Wine is the best thing to bring a hostess (or host…)!! Thanks for reading – and doing the linkup! Thank you! As I said in my post, it wasn’t intentional to have people arrive at staggered times, but it just worked out so well I’ll be sure to plan it that way next time. It made for staggered departures as well, which puts a different twist on the party too. I’m glad I was able to provide you with at least one helpful suggestion!